A. Charlois discovered asteroid #302 Clarissa. The hydroelectric power plant at Niagara Falls began supplying power to Buffalo, New York in the first long-distance commercial transmission of electricity. The first airplane flight from a ship was made by Eugene Ely in a Curtiss pusher biplane, taking off from a makeshift wooden runway built above the forward deck of the light cruiser USS Birmingham, at Hampton Roads, Virginia. Kerim Aliyevich Kerimov (14 November 1917 - 29 March 2003) was a Russian military officer involved in creating the earliest rocket units in the Soviet Union. Ascending positions in the rocket forces throughout the 1950's culminated in assignment as Commander of the Third Directorate of the Main Directorate of Missile Weapons (GURVO) in September 1960. Kerimov was First Commander of TsUKOS (1964-1965), Directorate Chief of Ministry of General Machine Building (1965-1974), and chaired the State Commission for Soyuz (1966-1991). O. Struve discovered asteroid #992 Swasey. NASA and the USAF launched X-15A CO/Opt Deg/Systems Test/Technology mission # 95 in which Joe Engle reached a maximum speed of 5288 kph (Mach 4.75), and attained a maximum altitude of 27.676 km. During the 0h 55m Gemini 12-3 "stand up" EVA, astronaut Buzz Aldrin photographed the Earth's limb and stars in ultraviolet light. USSR Zond 6 flew around the Moon, capturing photos of the far side. Zond 6 was launched 10 November 1968 on a Lunar flyby mission from a parent satellite (68-101B) in Earth parking orbit. It carried scientific probes including cosmic-ray and micrometeoroid detectors, cameras, and a biological payload, and was intended a precursor to manned missions. Zond 6 made a midcourse correction on 12 November and flew around the Moon on 14 November 1968, at a minimum distance of 2420 km. It went behind the Moon at 05:49:37, and emerged at 06:21:11. Zond 6 took spectacular photos of the Moon's limb with the Earth in the background. 5x7 inch (12.70 by 17.78 cm) photographs of the Lunar near and far side were obtained with panchromatic (black and white) film. Some of the views allowed for stereo pictures. They were taken from distances ranging from approximately 11,000 km to 3300 km. On the return leg, on 14 November, the hydrogen peroxide temperature aboard the L1 capsule fell from +20 deg C to -2 deg C. By the following morning, it was down to -5 deg C and in danger of disassociating into oxygen and water, so the capsule's orientation thrusters would not be able to function for re-entry. A color television camera was supposed to have been included in the cabin. If it was there, it could have been turned on to warm the capsule, but Mishin had insisted to the State Commission that it be deleted. The spacecraft could also be oriented so that the Sun would shine directly over the peroxide tank and warm it, but that might damage the 100K star sensor, which was mounted right next to it. A proposal was made that an attempt be made to orient the spacecraft using the ONA gyroscope package as flywheels, but Mishin and his deputies didn't want to try anything. Also during the return flight, a gasket failed on 16 November, leading to cabin depressurization, which would have been fatal to a human crew. In spite of the problems, the 7K-L1 made the first successful double skip trajectory, dipping into the Earth's atmosphere over Antarctica, slowing from 11 km/sec to suborbital velocity, then skipping back out into space before making a final re-entry onto Soviet territory. The landing on 17 November 1968 was only 16 km from the pad from which it had been launched toward the Moon. After the re-entry, the main parachute ejected prematurely, ripping the main canopy, leading to the capsule being destroyed on impact with the ground. One negative was recovered from the camera container, a small victory obtained over the Americans, but the criteria for a manned flight had obviously not been met. Mishin's only hope to beat the Americans was a failure or delay in the Apollo 8 flight set for December, the next Zond test was set for January. 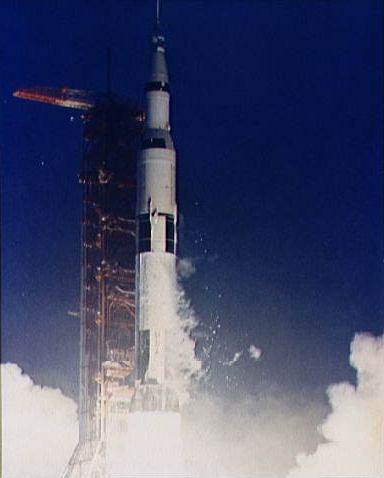 NASA launched Apollo 12, the second manned mission to the surface of the Moon. NASA's Mariner 9 became the first man-made spacecraft to orbit another planet when it went into orbit about Mars. USSR launched Molniya 1-25 from Baikonur for operation of the long range telephone and telegraph communication system, and transmission of USSR Central Television programs to the stations of the Orbita network. USSR launched Molniya 3-3 from Plesetsk to operate the long-range telephone and telegraph communication system within the Soviet Union, and to transmit USSR central television programs to stations in the Orbita and participating international networks. NASA's first Shuttle ferry flight test was made at Edwards Air Force Base, California, in which the Enterprise test article was carried in a flight lasting 3 hours, 21 minutes. NASA's STS 2 (Columbia 2, Shuttle 2), the first spacecraft launched twice, returned to Earth after carrying the Office of Space and Terrestrial Applications-1 (OSTA-1) experiment platform to space. H. Kosai and K. Hurukawa discovered asteroids #3291 Dunlap and #3320 Namba. During the 5h 42m STS-51-A-2 EVA, Discovery astronauts Allen and Gardner plucked a second satellite from orbit, retrieving the Westar-VI satellite. The NATO 3-D military communications satellite was launched from Cape Canaveral, Florida, which was positioned in geosynchronous orbit at 30 deg W 1985; 50 deg W 1985-1986; 21 deg W 1986-1991; 30 deg W 1991-1993; 21 deg W 1993-1997; 18 deg W 1997-1999. P. Jensen and K. Augustesen discovered asteroid #3596 Meriones. NASA's STS 66 (Atlantis 13, Shuttle 66) landed at Edwards Air Force Base, California, after carrying the ATLAS-3 and CRISTA-SPAS experiments to space. The STS 66 launch set for 11:56 AM EST on 3 November 1994 was delayed slightly while Shuttle managers assessed the weather at the transoceanic abort landing sites. The liftoff was the first for Atlantis since an extended checkout and modification period at the Rockwell plant in Palmdale, California: Atlantis departed KSC October 1992 and returned May 1994. The orbiter was returned to KSC outfitted with improved nosewheel steering, internal plumbing and electrical connections to accommodate an Extended Duration Orbiter pallet, and electrical wiring to enable OV-104 to be fitted with the Orbiter Docking System for docking with the Russian Space Station Mir. STS 66 further advanced the comprehensive effort to collect data about the Sun's energy output, chemical makeup of the Earth's middle atmosphere, and how these factors affect global ozone levels. Seven instruments on the Atmospheric Laboratory for Applications and Science-3 (ATLAS-3) also flew on the first two ATLAS flights. No other collection of space-based instruments provided the same extensive range of atmospheric measurements. Also considered a primary payload on the flight was the Cryogenic Infrared Spectrometers and Telescopes for the Atmosphere-Shuttle Pallet Satellite (CRISTA-SPAS), continuing the joint NASA-DARA (German Space Agency) series of scientific missions. ATLAS-3 and CRISTA-SPAS were considered as a joint mission with a single set of science objectives. During the mission, the crew was divided into two teams for around-the-clock research. ATLAS-3 instruments, mounted on a Spacelab pallet in cargo bay, included Atmospheric Trace Molecule Spectroscopy (ATMOS), which collected more data on trace gases in the atmosphere than on all three of its previous flights combined; Shuttle Solar Backscatter Ultraviolet Spectrometer (SSBUV), which took ozone measurements to calibrate the ozone monitor on the aging NOAA-9 satellite as well as cooperative measurements with other ATLAS-3 instruments; Active Cavity Radiometer Irradiance Monitor (ACRIM), which took extremely precise measurements of the Sun's total radiation for 30 orbits as a calibration reference for a sister instrument on Upper Atmosphere Research Satellite (UARS) launched in 1991; Measurement of the Solar Constant (SOLCON), provided by Belgium, which also measured solar radiation but as reference point to track changes over the years; Solar Spectrum Measurement (SOLSPEC), a French instrument, measured the Sun's radiation as function of wavelength; and Solar Ultraviolet Spectral Irradiance Monitor (SUSIM), which collected its highest precision solar ultraviolet radiation measurements in its 15 year lifetime. Millimeter Wave Atmospheric Sounder (MAS) collected nine hours of observations, measuring distribution of water vapor, chlorine monoxide and ozone at altitudes between 12 and 60 miles (20-100 kilometers), before a computer malfunction halted the instrument's operations. CRISTA-SPAS was released from the orbiter's Remote Manipulator System arm on the second day of the mission. Flying at distance of about 25-44 miles (40-70 kilometers) behind Shuttle, the payload collected data for more than eight days before being retrieved and returned to the cargo bay. The CRISTA instrument gathered the first global information about medium- and small-scale disturbances in trace gases in the middle atmosphere, which could lead to better models of the atmosphere and the Earth's energy balance. The second CRISTA-SPAS instrument, the Middle Atmosphere High Resolution Spectrograph Investigation (MAHRSI), measured the amounts of ozone-destroying hydroxyl and nitric oxide in the middle atmosphere and lower thermosphere from 24-72 miles (40-120 kilometers). MAHRSI yielded the first complete global maps of hydroxyl in the atmosphere. For retrieval of CRISTA-SPAS, a different approach method to the spacecraft was successfully tested as prelude to upcoming US Shuttle/Russian Space Station Mir docking flights. Called an R-Bar approach, it is expected to save propellant while reducing risk of contamination to Mir systems from orbiter thruster jet firings. STS 66 ended on 14 November 1994 when Atlantis landed on revolution 174 on Runway 22, Edwards Air Force Base, California. Rollout distance: 7,657 feet (2,334 meters). Rollout time: 49 seconds. Orbit altitude: 164 nautical miles. Orbit inclination: 57 degrees. Mission duration: 10 days, 22 hours, 34 minutes, two seconds. Miles traveled: 4.5 million. The landing was diverted to California due to high winds, rain and clouds in Florida caused by Tropical Storm Gordon, and was the fourth diverted landing in 1994 and the third in a row. The flight crew for STS 66 was: Donald R. McMonagle, Commander; Curtis L. Brown Jr, Pilot; Ellen Ochoa, Payload Commander; Scott E. Parazynski MD, Mission Specialist; Joseph R. Tanner, Mission Specialist; Jean-Francois Clervoy, Mission Specialist. Mike Brown, Chad Trujillo and David L. Rabinowitz discovered 90377 Sedna, a Trans-Neptunian object described as a cold planetoid, perhaps as large as 2/3 the size of Pluto. 90377 Sedna is a Trans-Neptunian object discovered by Mike Brown (Caltech), Chad Trujillo (Gemini Observatory) and David L. Rabinowitz (Yale University) on 14 November 2003. Its discovery was the farthest distance at which any natural object in the solar system has ever been observed. Sedna is described as a cold planetoid, perhaps as large as 2/3 the size of Pluto. Because of its cold, distant nature, and because all other extraterrestrial planets are named after (Roman) gods, the scientists who discovered it unofficially named it after Sedna, the Inuit goddess of the sea, who was believed to live in the cold depths of the Arctic Ocean. Sedna has a highly elliptical orbit estimated to take about 11,487 years, with its aphelion estimated at 942 AU and its perihelion at about 76.1 AU. At its discovery, it was about 90 AU from the Sun. This is the furthest from the sun that any solar system object has been observed. It will reach perihelion in 2075 or 2076. Sedna has an estimated diameter of between 1180 and 1800 kilometres (730 to 1470 miles), and may be the largest object found in the solar system since Pluto was discovered in 1930. Telstar 402 re-entered the Earth's atmosphere approximately ten years after it had failed during launch on 9 September 1994. TELSTAR 402, an AT&T geostationary communications spacecraft, was launched 9 September 1994 by an Ariane rocket from the Kourou Space Center in French Guiana. The spacecraft could not be contacted soon after launch: During pressurization of the satellite's propulsion system shortly after separation from its Ariane 4 launch vehicle, a pyrovalve firing created a leak that made the US$200-million satellite a total loss. Its backup, now named TELSTAR 402-R, was launched 24 September 1995 and suffered an on-orbit failure on 19 September 2003. At launch time, Telstar 402 was considered one of the biggest, most powerful, most capable communications satellites ever built. It had a launch mass of 3,331 kg and a total on-board power of 6.4 kW at the beginning of its 12-year design life, and was equipped with 24 C-band and 16 Ku-band transponders. The satellite re-entered the Earth's atmosphere approximately ten years after it had failed, on 14 November 2004. See also the sat-nd.com failure report page.